2010 Bird In Hand Merlot Private and small-group wine tours of the Barossa Valley, Adelaide Hills, and McLaren Vale. Adelaide Hills winery Bird In Hand first popped up on my radar in the early 2000s when Kym Milne, only Australia’s second Master of Wine, came into the fold to become head winemaker. Kym gave the winery clear focus and direction, turning it into one of the most respected wineries in the region today. Yes, they do much more than that $25 go-to bottle of bubbly you can find just about anywhere that *everyone* in Adelaide swears by. Fair enough too – it’s solid. Now for those that don’t know, 2010 in the Adelaide Hills was a stand-out year for wine. I remember tasting through the range at BIH, and it really was a stellar line-up with one bottle really leaving it’s mark on me – the Merlot. Fast forward to July 2016 and I’m running a wine tour through the Adelaide Hills. I decide to stop in at the Bird so my tour guests can try some of their standout reds like their Montepuliciano, Nero d’Avola, Shiraz, and of course the Merlot. Turns out they had the 2010 Merlot open for tasting that day. My eyes lit up and I just had to have a look. This has since led to me returning to buy more on two separate occasions, and writing this wine review – so here goes! Aromatics are rich and pronounced with lusciously thick black bramble and cassis front and centre. The earthy green herb notes like bay leaf take a backseat, while rich developed aromas like butterscotch caramel and tar come through thick and sapid, resonating deeply like a Tibetan throat singer working you into a trance. Mesmerizing stuff. 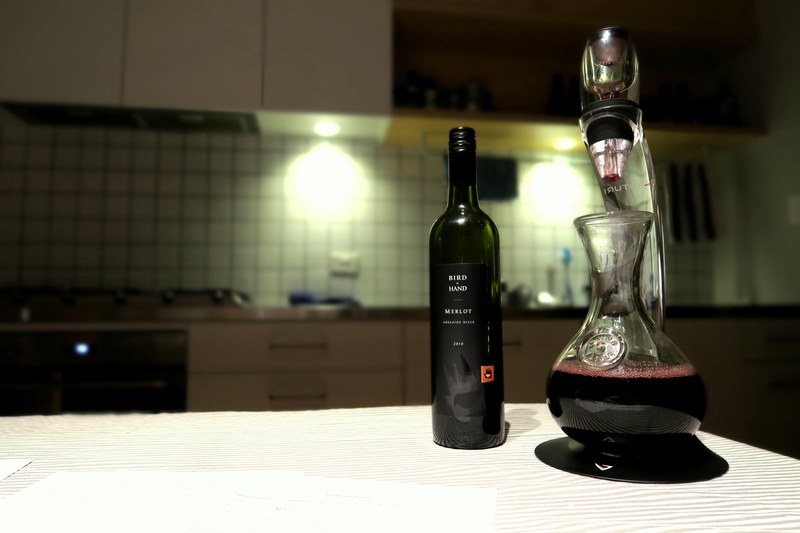 A deep and rich brick to blood red in the glass, the palate is round with chalky tannins that are quite grippy and it takes hours of decanting to really open up. Three hours was nowhere near enough – around twenty hours after aerating it was really looking gorgeous. Black olive tapenade, slightly burnt toffee, and cigar box dance effortlessly with the mulberry, blackberry, and cassis striking a beautiful balance between juicy fruit and developed secondary flavours. Long and lingering length shows dried figs working their way into the mix. With bundles of depth and complexity, plenty of ripe acidity, and still a solid backbone of structure, there’s still a good ten to fifteen years in this one before the arse end drops out of it. I’m looking forward to going back in a few years to catch up with this new friend. ATMOSPHERE: You’re going to want to chew on this wine, and you’re also going to thank me on the cheese tip. What better way to enjoy a bottle of red with cheese on a cold winter’s night than by rugging up on the couch and throwing on a movie. 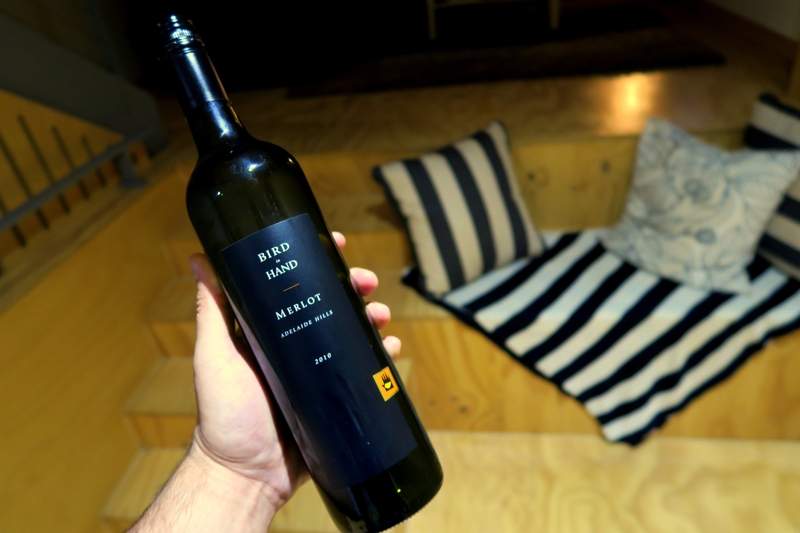 Head in to Bird in Hand winery on an Adelaide Hills wine tour with Small Batch Wine Tours who organise intimate and involved wine tours for the budding novice and connoisseur alike.